Ex-Pro High Capacity Long Life lithium-Ion cells with short-circuit, overvoltage and overheating protection. Ex-Pro Cell will meet the manufacturers original OEM specifications. 100% OEM compatible. Uses lithium-Ion technology to ensure maximum battery life and Power. Zero Memory Effect with low self discharge. NOTE :- This battery uses the Ex-Pro Chipset to decode the battery to allow charging on camera and visual power indication, same operation as the Original battery. Ex-Pro batteries come with our 2 year manufacture defect replacement warranty. Registered UK Battery producers. 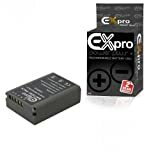 Ex-Pro® replacement Li-ion Battery. Can be used as a replacement or additional battery. Our cell’s are manufactured to the highest standard meeting or exceeding the original manufacturers specification and supplied with a 2 year RTB guarantee. Integrated Ex-Pro® chipset for exact function. Ex-Pro® batteries are fully tested and built with lithium-Ion technology to ensure maximum Power and battery life with zero memory effect and low self discharge. Compatible with your original battery and charger, save pounds on OEM manufactures replacement costs. Suitable for a wide range of Digital Camera’s/Camcorders listed. High Capacity Long Life lithium-Ion cells with short-circuit, over voltage and overheating protection. This entry was posted in Discount Photography and tagged Battery, BLN1, Camera, Digital, ExPro, High, Lithium, Olympus, Plus+, Power, Replacement by Ball Photo. Bookmark the permalink.